April 7th 2018 SNOW!!! AGAIN!!! Re: April 7th 2018 SNOW!!! AGAIN!!! It’s done. Time to move on to the Hurricane season! It's over. Stick a fork in the snow season. 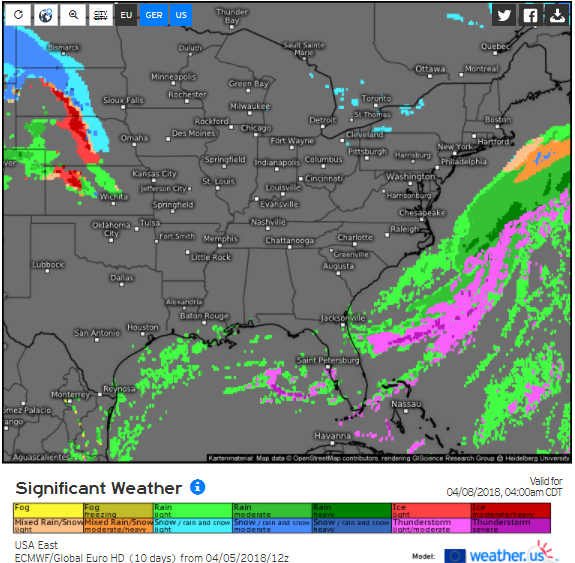 12z GFS not much changed from this morning and not much different than the 12z NAM. Shows snow in the morning as far north as central-north Jersey and Long Island. But keeps the heaviest snow over South Jersey. 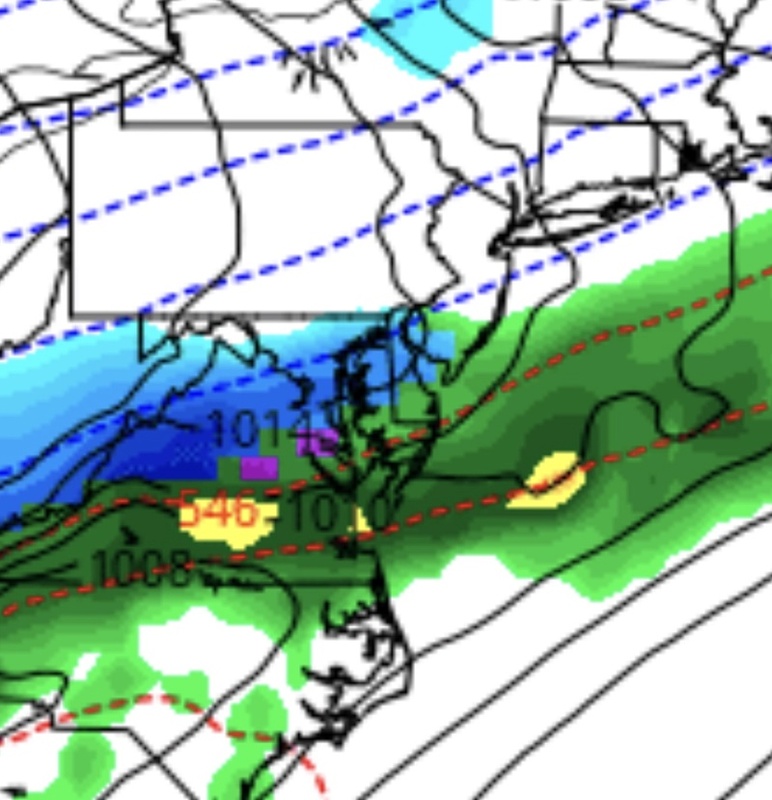 I choose not to write anything off at this point as I've seen these models vacillate like this too many times this winter including just last week. 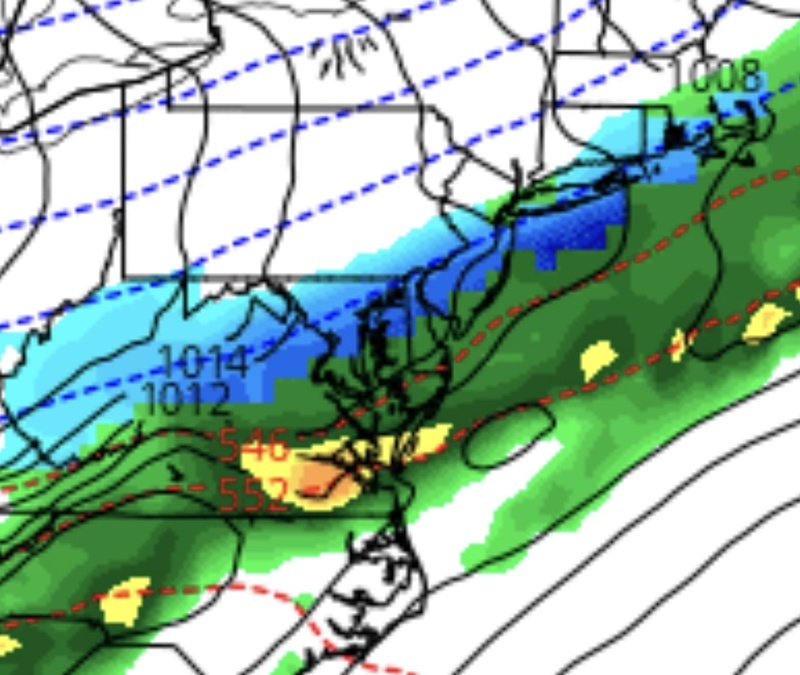 I would agree that the overnight runs were not a good sign for snow in this region and the midday runs have been only slightly better, but I can't totally write off a system when both the NAM and GFS as presently modeled have it snowing -- possibly moderately -- over my house Saturday morning. That wouldn't take a big shift to get me back into measurable snow. Also for the record, Accuweather -- which largely relies on these models for its (admittedly unreliable) "snowfall probability" has me at a 40 percent chance of 3-6" of snow and 34 percent chance of 1-3" of snow. (13% chance of 6-10 if you want to go crazy, lol). So even relying on these unfavorable model outputs I'm still in accumulating snow. Granted I'm slightly further south than a lot of people on this board so a south shift isn't as dire for me as it may be for some of the people further north. Maybe a couple inches from CNJ on south, but this threat quickly diminished in the last 24 hours. Frank_Wx wrote: Maybe a couple inches from CNJ on south, but this threat quickly diminished in the last 24 hours. I see all threats are gone so are we in the clear other than what's posted on scroll? So will it be clear sat? WeatherBob wrote: It’s done. 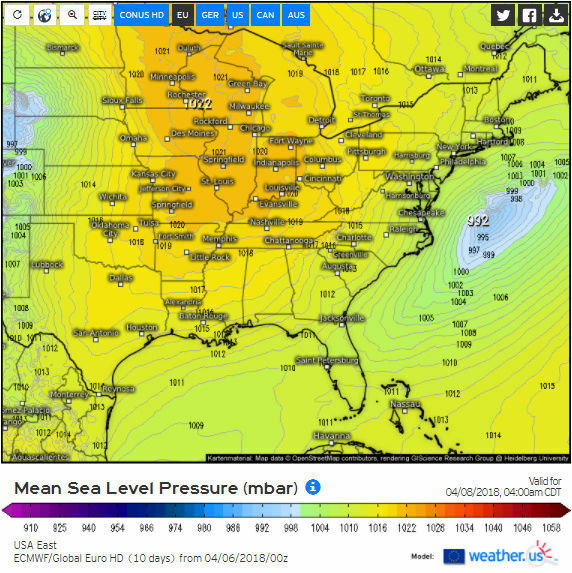 Time to move on to the Hurricane season! heck yeah ugg tracking is soooo long though lol. I heard it's supposed be average to slightly above this year. Also severe storms but no real predicting those. I would not write off Monday night yet. GGEM has a nice hit. Yes it’s only one model but you just never know. Bernie Rayno still not convinced threat is dead. Hard to believe a lion's share of guidance would be that off at this point though. If I were forced to place my money, I’d say this is a South - to maybe parts of Central Jersey - event, possibly clipping Long Island too, as GFS and NAM support that now. But the fact that the NAM has creeped back north since this morning gives me pause. My local says 1 to 3. I actually just edited that post because I think I posted 18z twice (instead of the 12z pic). Now looking at 12z, the 18z is north of that too. To me it's two things. 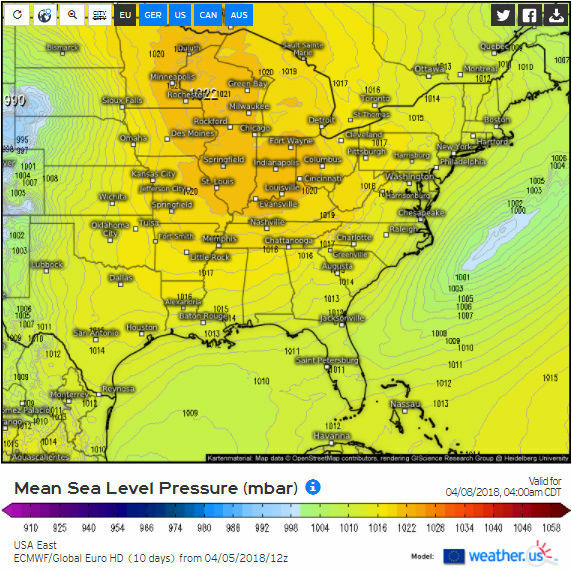 Weaker storm (frontal passage) and location. Yesterday was showing much stronger system and of course better location. I'd be more optimistic with stronger energy and then take chances on location. heehaw453 wrote: Bernie Rayno still not convinced threat is dead. Hard to believe a lion's share of guidance would be that off at this point though. If he's looking at the NAM he might well be noticing that it has steadily marched back north since its leap south this morning. 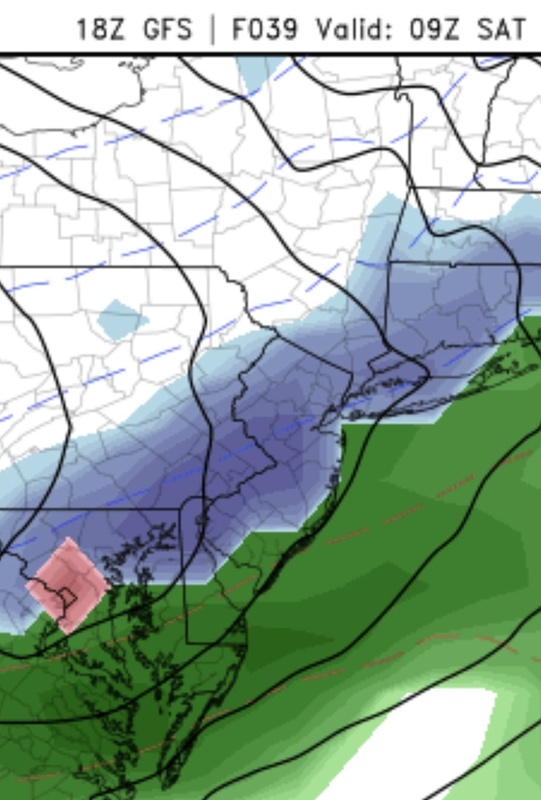 As I said above, I'd have to go with the current guidance showing the heaviest precip in South Jersey because the NAM and the GFS both show that. But I am still really hesitant to fully buy into the fact that this is a settled solution when the NAM had the northern extent of the precip south of Philly-AC this morning (50-75 miles south of where it was just 24 hours before) and now has it at the NJ/NY border. 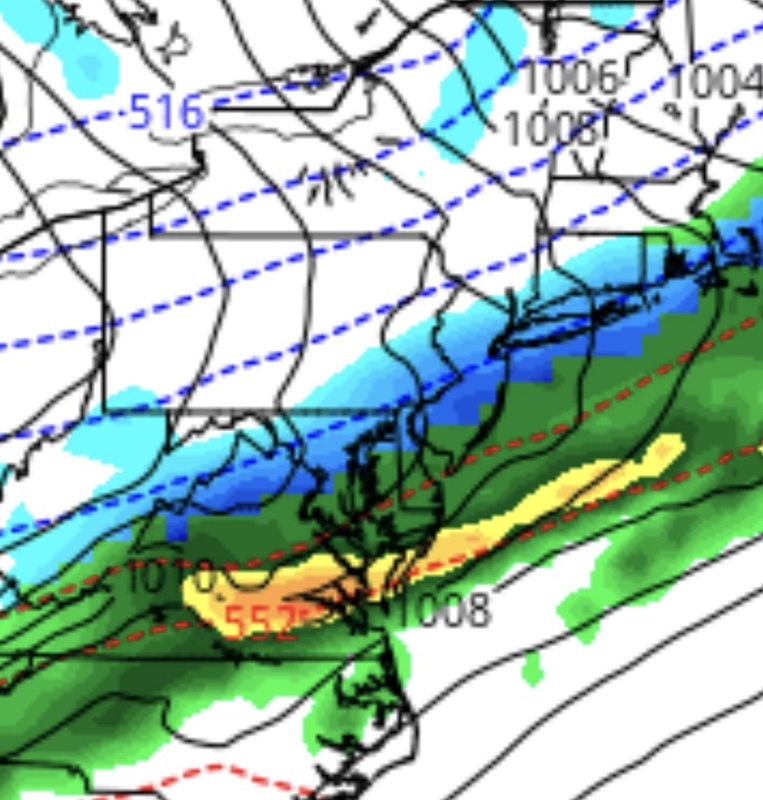 Per 18z GFS: Rain changes to snow around 2 or 3 am and ends by about 10 or 11 am for most. Duration wise that’s about the same as Mondays event. As you can see, it’s not that far south. A slight shift north COULD bring some mod.-to-heavy bands into some parts of this forecast area. This could be the last real shot at accumulating snow until December. I’m not giving up yet. Lol. One thing I noticed that catches my attention is what happens Saturday night into Sunday morning. Note: I am not saying this will happen. This is just an observation I noticed. We'll see throughout the day whether or not this northwest tick for early Sunday morning (the 8th) was a fluke. Models definitely showing the second of the two “waves” or Lows along the front tracking more north and closer to the coast Saturday night into Sunday. But not close enough at this time to give hope to anyone but extreme South Jersey and the Jersey Shore. 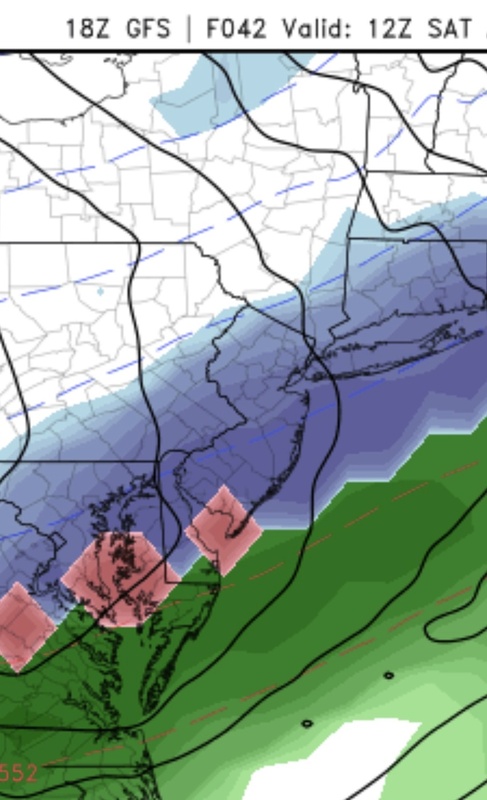 I guess I’d keep an eye on it for Cape May, Atlantic, Ocean and southern Monmouth and maybe eastern Long Island, but I doubt it gets far enough NW to give anyone else significant accumulation. I’m pretty much throwing up the white flag on this. Unless there is a dramatic last minute shift we are now inside if 24 hours for this system. Second wave’s track improved overnight but not enough (for most areas, maybe the shore). I guess there’s always hoping for miracles but I don’t see it shaking out right now. 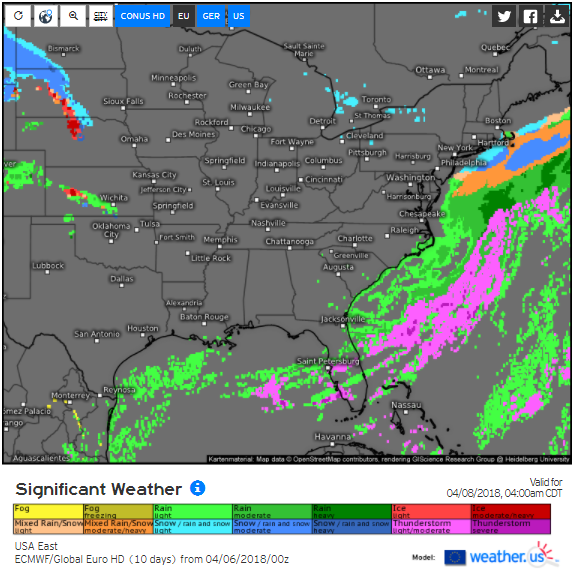 And while areas further north and west may still have hope later in April, my area has nearly zero history of accumulating snow after about April 10 so this was probably it for me. Beach time.